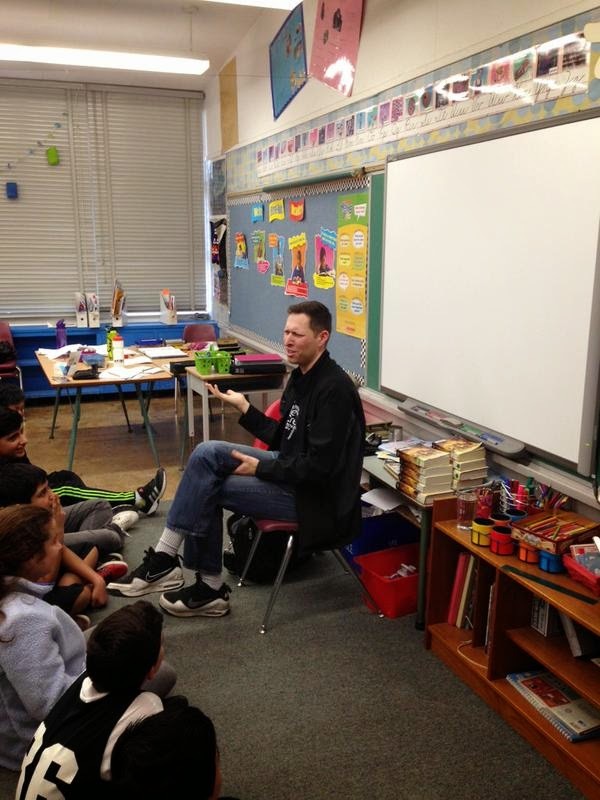 "Mark held our grade 6/7 students spellbound . . . He is a master of rapport with the students. They were very engaged and literally leaning forward in their chairs . . . "
"Mark Smith . . . had a mix of approximately ninety grade 8 and 9 students for each presentation and he handled these audiences with ease. . . . I highly recommend Mark as a most engaging guest author." Teaching sword fighting hand and foot positions at Walter Moberly Elementary, Vancouver. I give book talks about Caravaggio: Signed in Blood, which include discussions of the history of the Late Renaissance and Caravaggio's paintings, as well as a brief introduction to rapier fighting. I also conduct writer's workshops to get students actively engaged in their own writing. Let me know what your interests are, and I will design a school visit that suits the needs of your students. School visits typically cost $250 for an afternoon presentation, or $400 for a full day. The terms of the visit are negotiable, including the number of presentations, and the number and size of the groups. And finally, if you are considering inviting an author to speak, please read this excellent blog post in advance of the visit. It will make the experience much more rewarding for everyone involved. Book talk with grade 6 and 7 students at Morley Elementary, Burnaby. Mark held our grade 6/7 students spellbound as he wove the life of Caravaggio, his art, and life in Renaissance Italy into a great tale of intrigue, mystery and suspense. He is a master of rapport with the students. They were very engaged and literally leaning forward in their chairs as they listened to the very detailed and entertaining presentation. Thanks for visiting us at Admiral Seymour School - you have an open invitation if you need a 'gentle reader's' response to any of your future work!